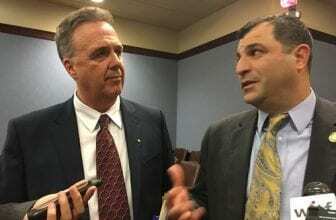 HARRISBURG, PA (WSKG) — A pair of bills that would overhaul the laws governing child sexual abuse in Pennsylvania have cleared their first hurdle in the state House–passing through the Judiciary Committee with a near-unanimous vote. Backers of the measures say they’re trying a different strategy after repeatedly failing to get previous iterations of the bills through the Senate. The reforms have been in the works for years, but got traction last summer after a sweeping grand jury report about abuse in Pennsylvania’s Catholic dioceses. Instead of being included in Rozzi’s main bill, the window for retroactive lawsuits it now wrapped into a second measure sponsored by Blair County Republican Jim Gregory. When his bill failed last session, Senate Republicans said along with constitutional concerns, they were also worried it might bankrupt churches. At one point, Senate President Pro Tempore Joe Scarnati pitched a compromise version of the measure that would have opened a retroactivity window but wouldn’t have applied it to institutions. Rozzi said this session, he’s hoping the caucus will at least take a vote. He and Gregory said at the very least, they’re confident the bills will pass in their own chamber. Debate in the House Judiciary Committee ahead of the bill’s passage was mostly positive. Gregory said he doesn’t think that holds water.